For me, watching the NHL playoffs is incredibly enjoyable. Especially this season's version, where all 8 playoff series were tied at one game a piece. The only downside that I can figure is that, most of the time, I'm stuck with the Versus version of the NHL playoffs. 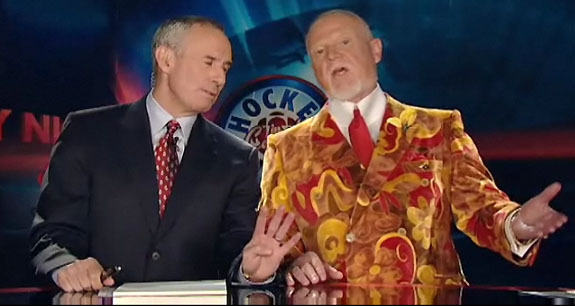 Don Cherry's suit: the same fabric used to carpet a Days Inn lobby in South Carolina. That's renowned Canadian hockey analyst Don Cherry during last night's Coach's Corner segment on Canadian broadcaster CBC. For all his racist undertones, at least Cherry has the dignity to put on a good suit every now and then. Here's the video of Cherry, analyzing the Pittsburgh Penguins and Ottawa Senators. I say all this about sports coverage on the same day that the ESPN Ombudsman, Don Ohlmeyer, responds to viewer criticism about the announcers who work live games for the World Wide Leader. The overwhelming criticism seems to be that the announcers don't focus on the game and, instead, spend time talking about unrelated topics (see Sunday Night Baseball or any telecast involving Jeff Van Gundy), interviewing irrelevant persons, and abstaining from their sole purpose - explaining and informing the action. The topic is especially appropriate considering that ESPN has decided to employ a primarily-British announcing team for the upcoming World Cup. Much like watching the Canadian telecasts and analysis of hockey, I proclaim that there is nothing quite like watching a soccer match voiced by the likes of Martin Tyler or Ian Darke. It seems obvious to say that announcing is not a science. But, for too long, networks have assembled announcer corps in the U.S. that adhere to a formula, pairing a garrulous former player with a professional broadcaster voice (Jim Nantz, Greg Gumbel, Brent Musberger, Mike Tirico) that happily fills every second of airtime - leaving nary a second of silence. But Canadian hockey broadcasters - and not looking specifically at Cherry, since he doesn't do game announcing - and British soccer broadcasters do it best because they understand that announcing is an art form. A side-by-side comparison would reveal the quality, subtlety, and nuance that escapes the likes of most American announcers - for any sport (see Dan Dierdorf or Verne Lundquist, just to name a few). And that quality American sports announcing - the likes of Jim McKay, Keith Jackson, or Marv Albert, - is a dying breed.